Hi all! I snapped up these three polishes from Different Dimension’s Black Friday sales. They were all mystery polishes and good deals too ($5). The maker was also running a giveaway contest in the fan group at the same time for a polish thrown in with your order and I also won that! 😀 Let’s take a look at Doorbuster #1 Unity, Doorbuster #2 Belonging, Doorbuster #3 Community, and Thankful For You. Unity is a bronze linear holographic polish. Formula on this is sheer and a bit thin; it dries satin. This is 3 coats plus top coat. 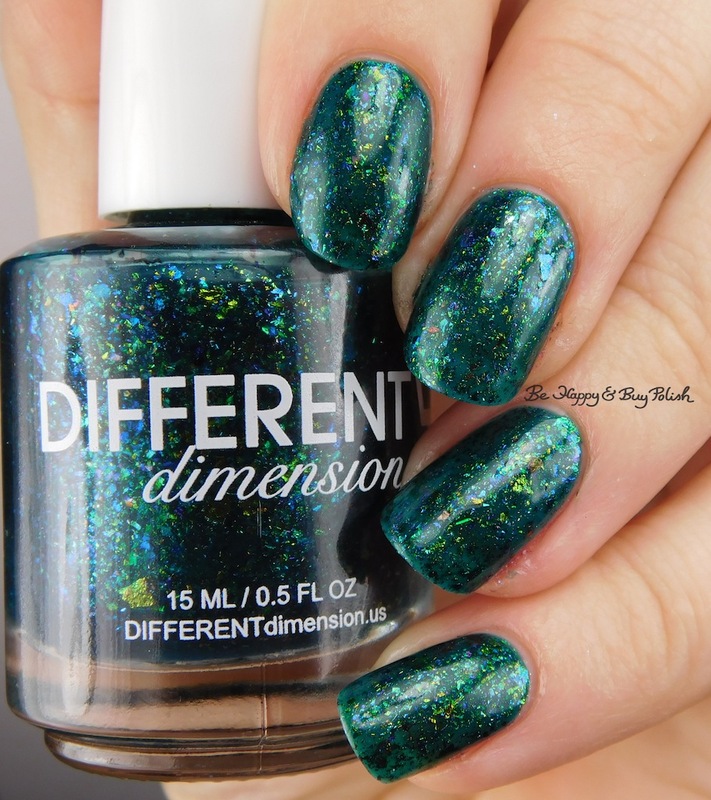 Belonging is a green based polish with flakies of teal, green, blue, and gold. Formula is sheer and thin though I had good flakie coverage. This is 3 coats plus matte top coat plus shiny top coat. 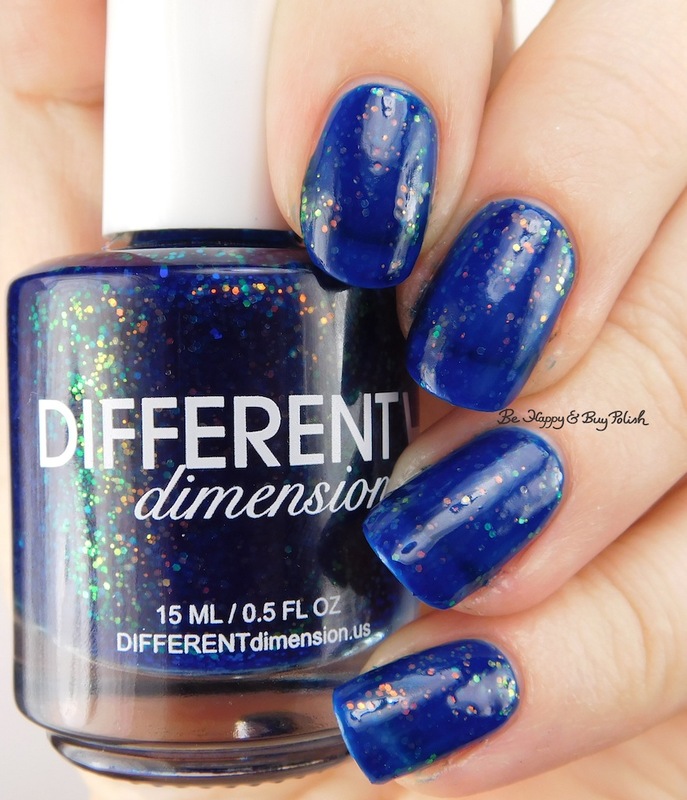 Community is a blue based jelly polish with micro iridescent color shifting glitters. This is definitely a jelly polish; the glitters do stick up. This is 3 coats plus matte top coat plus shiny top coat. Not my favorite. Thankful for You is a pink based holographic polish with holographic micro glitters. Formula is sheer but has a good thickness; it dries gritty. This is 3 coats plus top coat. I’m not usually a pink polish person but this is a nice change. There were 6 doorbuster polishes in all – I only had a chance to grab these three. Did you grab any of the door busters? I really like the look of each of these. Oh, these are stunning! You’re making me sorry I didn’t get any of these on Black Friday, but I bought too much polish as it is! I tried really hard to be good on Black Friday! Haha! It isn’t easy when everyone is having awesome deals. SO HARD. I was just grateful that I could take part though – so many of the deals are basically meaningless when you’re international so firstly I was in the US for this one and secondly I actually had some polish money! So yay! The bronze one is beautiful! I’ve not heard of this brand before.